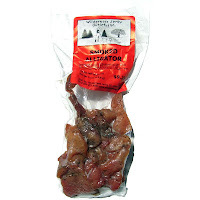 Last in the series on Wilderness Jerky Outlet is this Smoked Alligator. See my previous reviews of their other smoked meat products. Alligator, seasoning (brown sugar, salt, sugar, spices, onion, garlic), water, vegetable dry powder (celery juice, sea salt, raw sugar, spices), lactic acid starter culture. The first thing I taste from the surface of these pieces is a light sweetness, with just a tad of smokiness. I can also pick up a light black pepper flavor, and light saltiness. The chewing flavor starts with a natural meat flavor and a bit more saltiness. The black pepper gets stronger, along with a garlic & onion seasoning. The sweetness also continues on. For being labeled as "Smoked Alligator", this does have a noticeable natural meat flavor in the chewing. I'm comparing this to my review of Mountain America's Alligator Jerky, which I also found a well-noticed natural meat flavor. In that review, I said it had a slight fishy flavor, as well as a faint turkey aftertaste, and I also find that here in this Smoked Alligator. But I think Mountain America's actually has a little bit more natural meat flavor than Wilderness Jerky Outlet. And as for being labeled "Smoked", I'm not finding much smokiness, maybe just a tad on the surface flavors. Otherwise, smoky is not really a word I'd use to describe this. By contrast, Mountain America's alligator jerky had more smokiness. But the natural meat flavors in this still seem to define the overall flavor. However, the black pepper is quite well pronounced too. However, the natural meat flavors tend to stay in the center of my palate, while the black pepper is largely in the back of my mouth. There's also a fair amount of oiliness on the surface and I can pick up that flavor too. 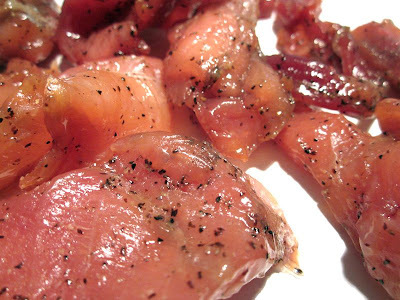 The seasoning of garlic and onion colors the meat flavor but doesn't overpower. The level of saltiness in this feels to be at a medium level. Finally the sweetness continues all throughout, from the surface flavors and into the chewing. It's not that heavy, perhaps most strong on the surface, and then just light in the chewing. Overall, what you're going to notice is a natural meat flavor having a slight fishy flavor and slight turkey aftertaste. Then you'll notice a fair amount of black pepper with lighter amounts of garlic & onion seasoning, sweetness, and a medium saltiness. These are slices of whole meat, sliced into thick chunks. This is a moist jerky with a wet, oily, and slightly sticky surface feel. These pieces have little flexibility in that they crack open with any amount of bending. Biting off chunks varies from easy to labored, and chewing seems overall easy, though some pieces are a little more labored. chews. It has a rubbery quality to it, similar to a calamari steak, but still with a fibrous character. It ends up breaking up into smaller chunks and bits and doesn't really mesh together like meat. It's almost more comparable to dried smoked fish in the way it crumbles apart. Most of these pieces have bits of fat on them, though I didn't encounter anything unchewable in the way of gristle or tendon, and no stringiness, nor anything crunchy. As for clean eating, there's a good deal of moisture, oily, and stickiness on my fingers requiring a licking and wiping with each handling. Wilderness Jerky Outlet sells this Smoked Alligator from its website at a price of $9.25 for a 4oz package. I bought several other of their jerky varieties and sizes for a total of 32oz at $62.00. They waive the shipping if you buy over $50.00. That worked out to $1.94 per ounce. For general jerky snacking purposes, at the $1.94 per ounce price, it seems to provide a good value. I'm getting a good deal of snackability for its overall good flavor, good meat consistency, and decent chewing texture. That's close to what you'd pay for the major brands of jerky at grocery stores, and this certainly provides a lot more snackability. As a Smoked Alligator jerky, at the same $1.94 price per ounce, it's an excellent value. Other brands of alligator jerky I reviewed start at $2.22 per ounce and go up to $5.43 per ounce. This is the cheapest alligator jerky I've found so far, and yet it seems to be quite good in both flavor and meat consistency, though I'm only getting a light touch of smokiness. 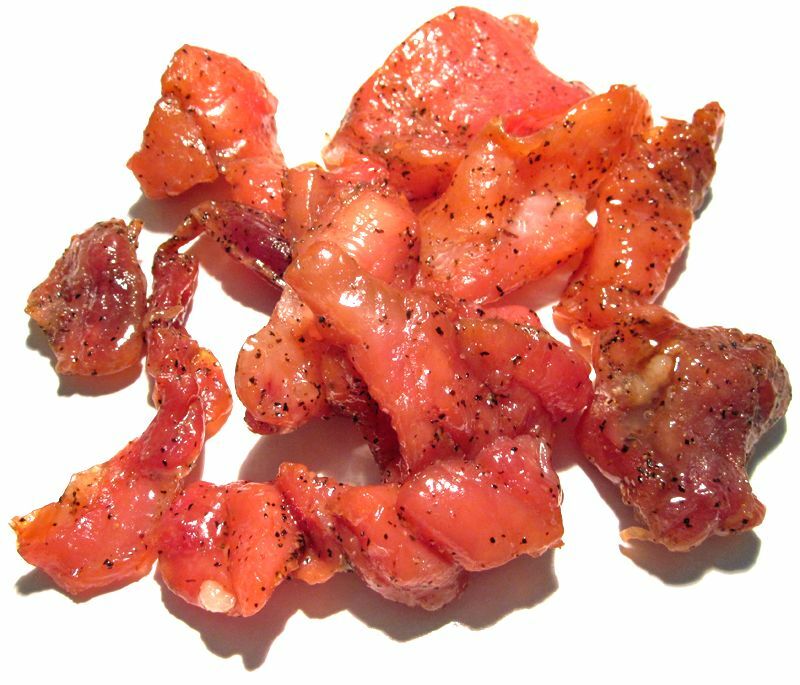 This Smoked Alligator from Wilderness Jerky Outlet offers a well noticeable natural meat flavor, that seems to have a touch of fishy flavor and a light turkey aftertaste. It's not the strongest natural meat flavor I've found in an alligator jerky, that distinction still seems to be with Mountain America's brand. But Wilderness Jerky Outlet seems to have a more moist, and softer chew than Mountain America's. In terms of seasoning, Wilderness Jerky Outlet also seems to be a little more savory with a tasty combination of sweet, garlic & onion and black pepper than compared to Mountain America. But Mountain America's seems to have a better chewing texture, chewing more like real meat. Either way, both Wilderness Jerky Outlet and Mountain America seem to offer a good alligator jerky, though both didn't really give me that "wow factor" I'm looking for in a higher-rated jerky. I didn't really get much smokiness out of this, considering it's labeled "Smoked", and the natural meat flavors in this are not as well pronounced as I found in the company's Smoked Beef, Smoked Wild Boar, and Smoked Kangaroo. For my recommended beer pairing, the sweetness and oiliness in this needs to be offset by a lighter and more bitter flavor, go with a standard IPA, like the Stone IPA or the Sierra Nevada Torpedo IPA.